His Majesty King Hussein bin Talal, the father of modern Jordan, will always be remembered as a leader who guided his country through strife and turmoil to become an oasis of peace, stability, and moderation in the Middle East. Among Jordanians, his memory is cherished as the inspiration for Jordan’s climate of openness, tolerance, and compassion. Early in young Hussein’s life, and on July 20, 1951, his grandfather King Abdullah was martyred at al-Aqsa mosque in al-Quds (Jerusalem). Hussein was there, with his grandfather, as they went regularly to perform Friday prayers. A medal King Abdullah had recently given the young Prince Hussein, and which he wore after his grandfather’s insistence, saved Hussein from the assassin’s bullet. Throughout his long and eventful reign, King Hussein worked hard at building his country and raising the living standard of each and every Jordanian. Early on, King Hussein concentrated on building an economic and industrial infrastructure that would complement and enhance the advances he wanted to achieve in the quality of life of his people. On the human level, the numbers speak for King Hussein’s achievements, for he always believed that Jordan’s people are its biggest asset, and throughout his reign, he encouraged all -including the less fortunate, the disabled and the orphaned- to achieve more for themselves and their country. 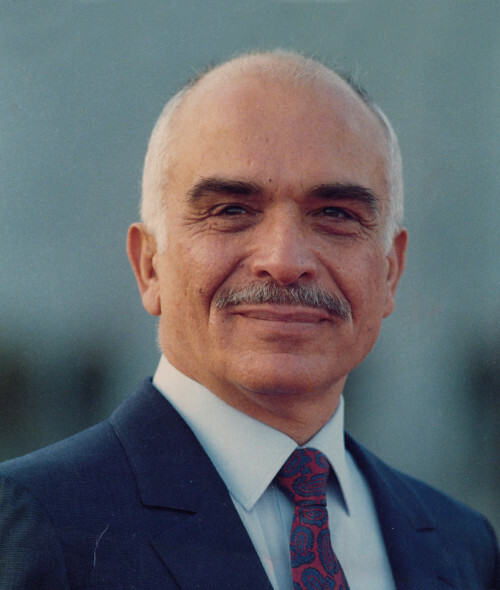 King Hussein dedicated himself throughout his 47-year reign to promote peace in the Middle East. After the 1967 Arab-Israeli war, he was instrumental in drafting UNSC Resolution 242, which calls on Israel to withdraw from all the Arab lands it occupied in the 1967 war in exchange for peace. In 1991, His Majesty played a pivotal role in convening the Madrid Peace Conference and providing an “umbrella” for Palestinians to negotiate their future as part of a joint Jordanian-Palestinian delegation. King Hussein’s commitment to democracy, civil liberties, and human rights has helped pave the way in making Jordan a model state for the region. The kingdom is internationally recognized as having the most exemplary human rights record in the Middle East, while recent reforms have allowed Jordan to resume its irreversible drive to democratization. King Hussein married Queen Noor on June 15, 1978. They have two sons -Hamzah and Hashem- and two daughters -Iman and Raiyah. His Majesty is also survived by three sons His Majesty King Abdullah II, Faisal, and Ali- and five daughters -Alia, Zein, Aisha, Haya and Abeer- from three previous marriages. At the time of his passing on February 7, 1999, His Majesty was the longest serving executive head of state in the world. Of great significance to Muslims throughout the world, the late King Hussein was also the fortieth generation direct descendant of the Prophet Muhammad.